This is the second Lanolips product I’ve ever tried and this brand is amazing. The 101 Ointment Fruities range consists of three flavours, strawberry, apple and peach. Each flavour contains the lanolin and vitamin E as well as ingredients from the corresponding flavour. The flavour I’ve got to review is peach. Peach kernel oil’s lightness sinks into the skin easily & helps revive with a combination of vitamins & polyunsaturated fatty acid. I love the smell of peaches and I’m not disappointed by this. It’s beautiful and not overly sweet, overpowering or artificial. The smell lasts slightly longer on my skin than on the lips. When I say skin, I mean the back of my hands when I was testing it. The consistency is thick but it did glide on without any issues when on contact with the lips. My lips didn’t stick together and found it had lasted well during feeding and drinking time. I’m surprised it stayed on for hours. 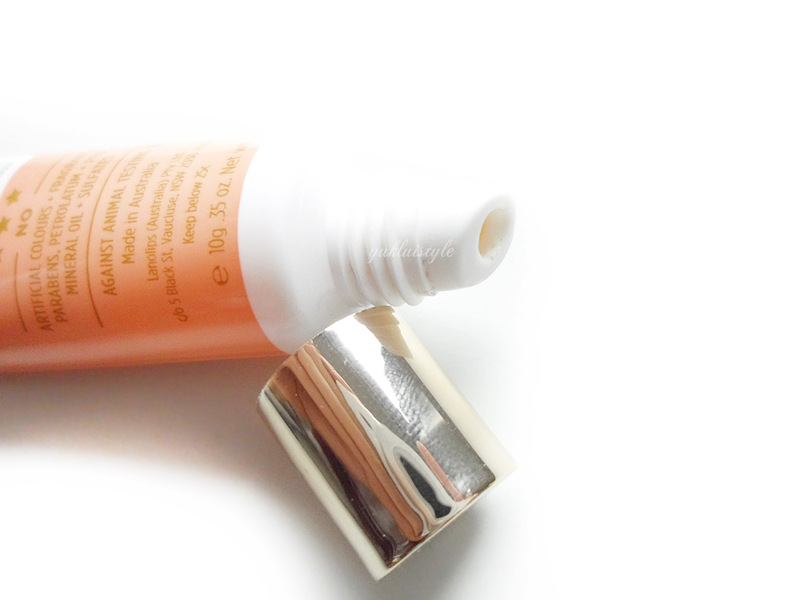 It is a rich balm and leaves the lips feeling smooth, soft and moisturised with a dewy shine. On the back of my hands, it’s absorbed into the skin when massaged without leaving a trace of shine or a sticky feeling. This is the classic Lanolips packaging, the colour matching the fruit, easy to use and are able to squeeze the desired amount. I’ve only properly tested this on the lips properly but can imagine it being amazing on dry areas of the skin too. Due to it’s size, you can just throw it into your bag and use it for your dry skin emergencies. This is definitely going to be my winter staple for those chapped lips. It’s great as an overnight treatment too buy adding a little bit more than usual. It doesn’t contain artificial fragrances, parabens, petrolatum, peg’s, mineral oil, or sulfates. Woop woop! This is slightly pricey if you compare it to Carmex, Vaseline, Nivea etc but I prefer this over the others. You can purchase it here and is available nationwide. Have you tried any Lanolips products? I too love the smell of peaches (they remind me of my childhood) and what pretty packaging. This isn't a brand I've heard of before so I'll be looking them up. I have not heard of lanolips but will definitely check it out. No I haven't but I want to try this. Sounds fab. This is totally new to me I haven't heard of it before but it sounds really good. I love the sound of the scent bet it's lovely. This looks lovely – never tried something like this before! I am so hopeless when it comes to using lip balm, I actually dont think I have even ever owned one! Never heard it but it does look gorgeous. Simple and nourishing. Love the varieties of flavors too.